Now that spring is in the air, many of us are going through our closets, removing the winter clothes, and hanging up the summer clothes! Now is the ideal time to make sure expensive wool, silk, and cotton clothes are stored properly so as to be safe from damaging clothes moths! If you don’t store these items properly, you may be surprised to find holes in the material when using them for the first time next winter! 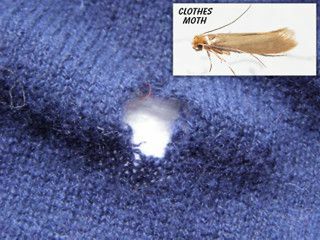 Not only are expensive wool garments damaged and often unrepairable, the time associated with re-mediating a clothes moth infestation makes the situation even worse. We suggest that you take a little more time this spring to be sure that wool materials are safely stored and protected from clothes moths. Both chemical and natural moth repellents can repel moths, however natural remedies will require more product to derive the same results. We stock a variety of moth ball, moth cake and other chemical moth products with paradichlorobenzene in them. These solutions have been used for years and provide excellent results. In the case of a moth cake product (such as Reefer Galler’s No Moth products), all you have to do is hang them up in your closet and keep the doors closed to let the penetrating vapor kill the moths and their larvae. In the case of moth balls or crystals, you are best served sealing these products inside an air-tight garment bag along with your clothes that you want to protect. Heavy duty poly ZipLoc bags or canvas totes often work just as well too! The goal is to create a smaller area of sealed storage, so that the vapor can effectively kill and prevent moths that might be inside. Despite the odor that is present with each of these products, it is a non-clinging odor that will diminish when allowed to air out after storage. For those that want to reduce their contact with chemical insecticides, there are some great all natural solutions to protect your wool clothes while in storage. With all natural products, you must use them inside of sealed garment bags or heavy duty zip bags so that the moth repelling ingredients can reach a sufficient level. Two products to consider are Moth Away sachets and cedar blocks or sachets. Moth Away sachets is a peppermint-based product so the predominate smell is very appealing for most individuals. Cedar is made in the form of balls or blocks or a small sachet and can be place on the top of your clothing in the garment bag to create the same effect. The nice thing about the cedar is the fact that it can be reused several times over. Simply sand the cedar to restore its natural insect repelling properties! If you have cedar closets or chests and they are losing their aroma, then we recommend you give them a light sanding to open up the pores. Follow up with apply 100% cedar oil with a soft cloth – this will restore the natural aroma back to the cedar wood and you will be as good as new! All of the products mentioned in this article are available in our Housewares Department. If you have any further questions or concerns, please stop into our store and talk to one of our expert sales clerks. Thanks for reading and happy spring!